□ On April 27, 2011, the small town of Smithville, Mississippi, was devastated by one of the most violent tornadoes ever surveyed. 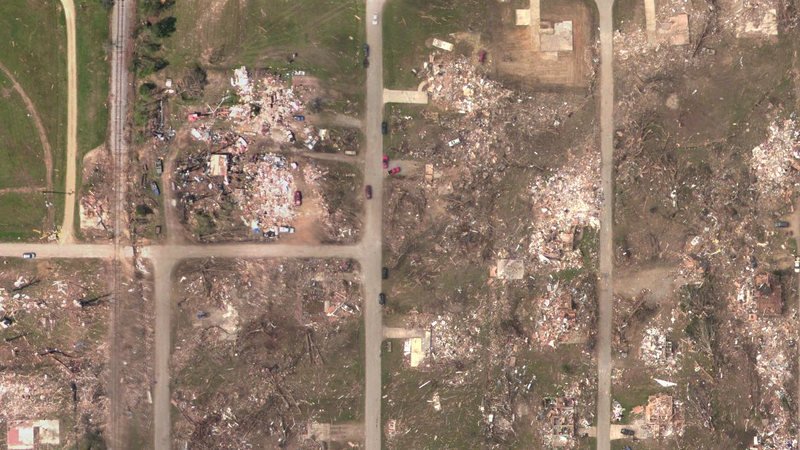 Below is a compilation of aerial photographs detailing the first four miles of the EF5 tornado’s damage path. The tornado continued for an additional 34 miles and caused more deaths in Alabama, but the remainder of the tornado’s path was primarily over unpopulated marshland and of lesser intensity. Satellite images of tree damage indicate that the tornado reached maximum intensity soon after touching down and likely weakened not long after exiting Smithville. The NWS report lists 23 fatalities for the tornado’s entire path. With 17 fatalities confirmed in Monroe County and seven deaths reported in Alabama, a death toll of 24 appears accurate. The visible touchdown point of the Smithville tornado was just east of the Tennessee-Tombigbee waterway. The tornado immediately exhibited a narrow core of intense winds (less than 10 yards wide at some points) imbedded within a larger damage swath. The tornado intensified extremely rapidly and was likely powerful enough to level a home within seconds of touchdown. The tornado reorganized two miles southwest of Smithville and briefly left a trail of intermittent damage with several distinct damage swaths. A narrow, intense vortex abruptly developed at the edge of a wooded area (seen just left of center) and continued all the way through Smithville. Within seconds, the narrow wind feature was powerful enough to leave deep scouring marks in a field. This is an indication of EXTREME intensity. Close up view of deep ground scouring. Up to 12-inches of topsoil was removed. Scouring patterns were of continuous but varying severity for the next two miles. A gas station that had been converted into an apartment building was swept cleanly away, leading to the tornado’s first fatality. Three unoccupied mobile homes nearby were obliterated. A large freight rig that had been parked in the apartment’s dirt driveway was torn apart and hurled approximately 200 yards to the northeast (the NWS page incorrectly estimates the rig was thrown 1/4 to half a mile). Vehicles throughout the tornado’s path were thrown long distances, many more than half a mile. The Smithville tornado paralleled Highway 25 (soon to be called Main Street) and directly encountered its first well-constructed home 1.5 miles after touchdown. The home was swept away in EF5 fashion and grass was scoured from the ground. The EF5 damage path was about 30 yards wide. Lighter damage occurred over a larger area approximately a quarter mile in width. Wind damage was far more expansive to the south of the tornado’s center. This was the result of the tornado’s rapid forward speed, which added significant momentum to the storm’s right half. 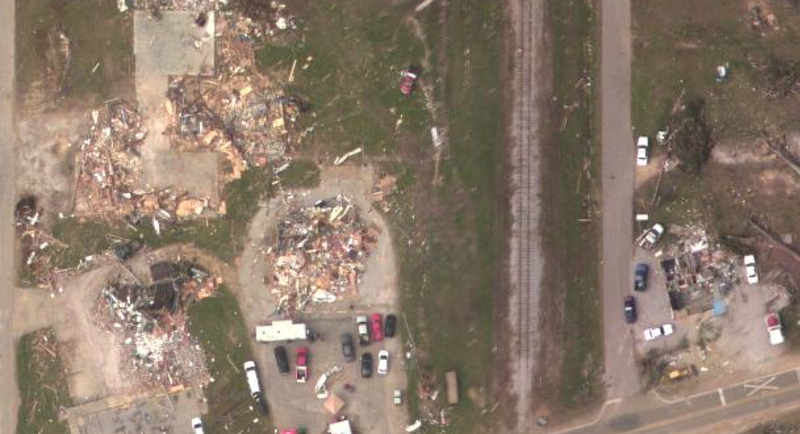 The narrow path of the tornado’s inner core is marked by the scoured grass to the north of Main Street (upper left corner). Six more people were killed in homes that were swept completely away along Highway 25. A survey team later concluded that “in the core of the tornado, you had to be underground or in a safe room to survive” (Hayes, 2011). Moving at 70mph, the tornado took only seconds to sweep two large, well-constructed brick homes from their foundations. Nearby, a grove of large hardwood trees was obliterated. The intense inner core shifted away from Main Street and raced into a neighborhood north of Smithville’s business district. The EF5 damage was confined to a narrow corridor, but moderate to severe damage spread several blocks to the south. 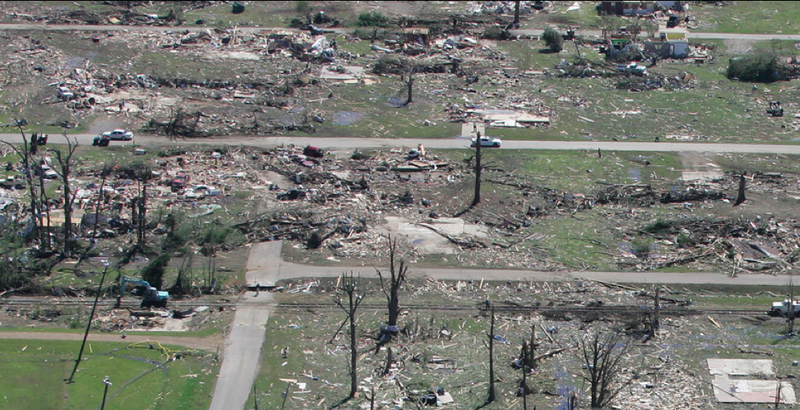 Extensive wind rowing is evident – a damage feature unique to the most violent of tornadoes. A red SUV was hurled a half mile through the air before impacting the top of the 130ft Smithville water tower, leaving a visible dent. The vehicle was then thrown an additional quarter mile before coming to rest at the end of Cemetery Drive. Photographs indicate the SUV was crushed into a ball only a few feet across. 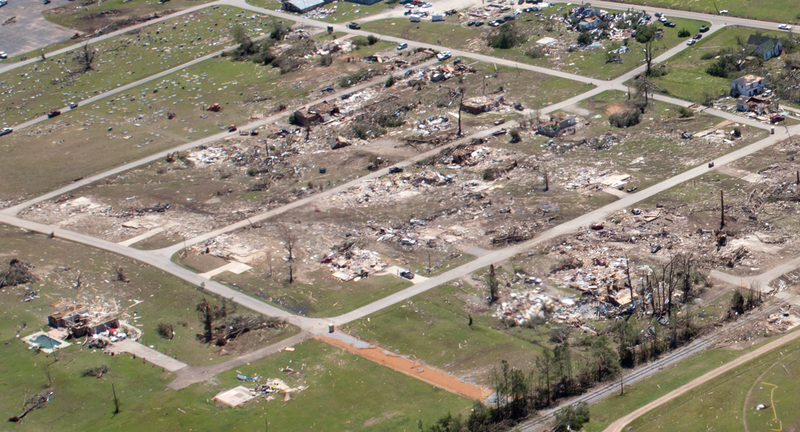 Wide view of the tornado’s path through the northern section of town. The streak of EF5 damage was imbedded within the tornado, which enveloped nearly all of the buildings visible above. There were 16 fatalities in Smithville, a remarkably low figure in relation to the number of buildings that experienced EF5 damage. The low death toll is attributed to the fact that the tornado struck in the middle of a workday when many of the homes were vacant. Multiple instances of EF5 damage between Monroe and Maple Street. Survivors reported that the fast moving tornado lasted less than ten seconds. Pronounced ground scouring is visible within the center of the damage track. Most of the giant hardwood trees that decorated the area were snapped just above ground level. A section of missing road can be seen on Market Street (at left center) near the railroad tracks. While initially reported as tornado damage, a later report indicated the road was purposefully demolished in order to deter traffic over the damaged culvert (Knupp and Laws, 2012). The businesses along Main Street suffered severe damage despite being outside the tornado’s inner core. A Piggly Wiggly supermarket (large building at bottom center) was gutted by violent inflow winds. Farther north, a cluster of mobile homes was swept away in the core damage path, causing one death. The twisted frames of several mobile homes were thrown a half mile and found wrapped around debarked trees to the east of Cemetery Drive. Fortunately, it appears that, with the exception of the single fatality, none of the other residents on the block were home at the time. Close view of buildings along Main Street. A large, two-story brick column post office (bottom left) collapsed with several people inside, all of whom survived. A neighboring business to the north was reduced to a concrete slab. Surveillance cameras at the Smithville police station (bottom right) captured the only known footage of the tornado from within town. One survivor on Main Street described the tornado as a quick “blast of air” from the southwest, like “a nuclear shock wave”, that flattened all of the buildings at once. Three large, well-constructed homes with extensive foundation anchoring were reduced to bare slabs. Surface vegetation was scoured from the ground. 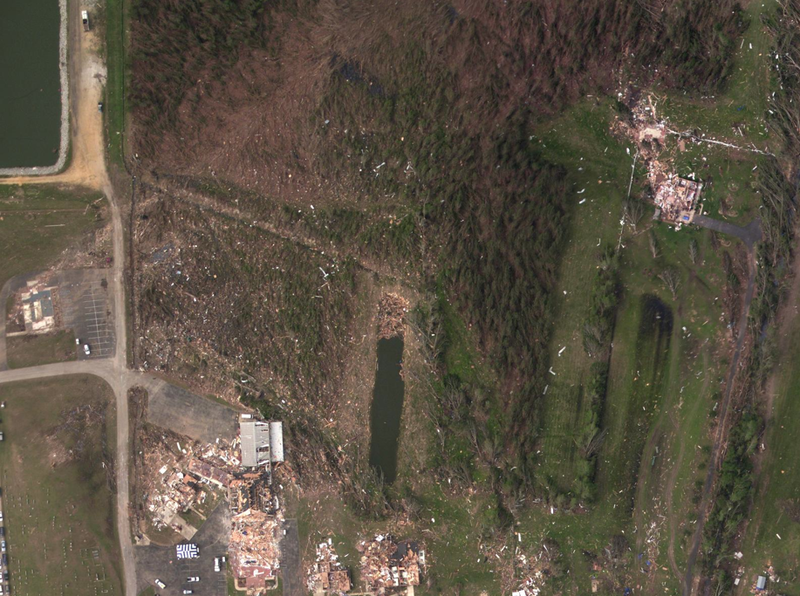 Wide aerial view of the swath of EF5 damage. Seven additional fatalities occurred east of the railroad tracks between Earl Frye Street and Cemetery Drive. There were no survivors in the three obliterated homes on Monroe Street (visible at left center). 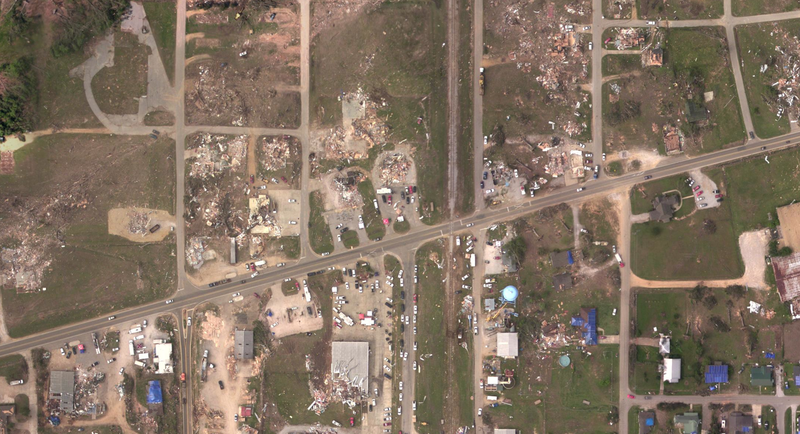 Before the tornado struck, the city built an extension of Monroe Street using gravel and tar in order to build new houses (visible at bottom center). The tornado blew the exposed tar (not pavement) from the street, leaving bare soil underneath. 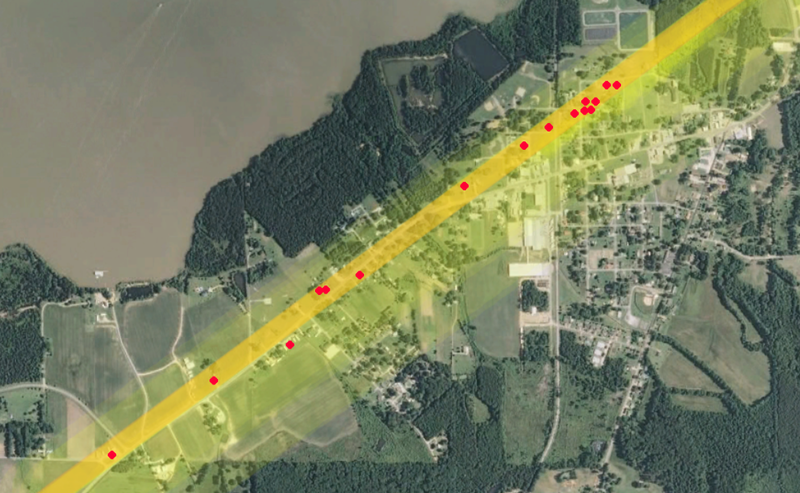 Map of the tornado’s path through town and the location of each fatality (there were two homes where two fatalities occurred – both marked by connected dots). The swath of EF5 damage is highlighted in light orange. Only one death occurred outside the narrow zone of extreme damage – a young women was killed in a trailer on the south side of Highway 25. A large funeral home was swept cleanly away as the tornado exited town and entered a forested area. The building was empty when the tornado struck, preventing the death toll from climbing even higher. Pulverized vehicles, utility poles, and debris from across town were left strewn among the debarked trees. A wide view of damage on the east side of Smithville. 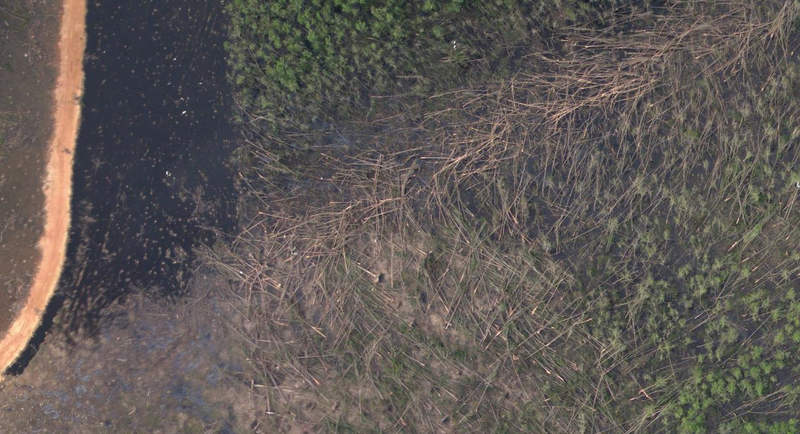 The tornado’s complex wind distribution is visible through the damage patterns in the forest. 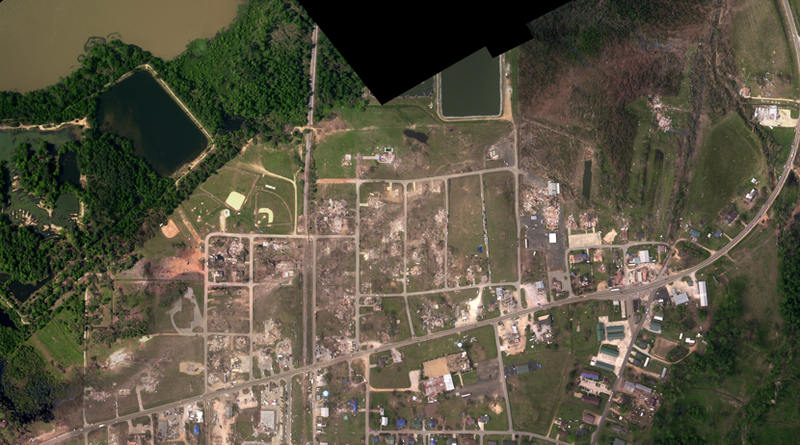 Several large, re-inforced brick buildings (bottom center) experienced EF3 and EF4 damage well outside of the worst affected areas. The Smithville Baptist Church was nearly leveled by a rush of westerly winds that hurled cars into the building’s few remaining walls. The tornado may have weakened slightly as it passed north of Smithville High School, but winds likely remained in the EF5 range for several additional miles. 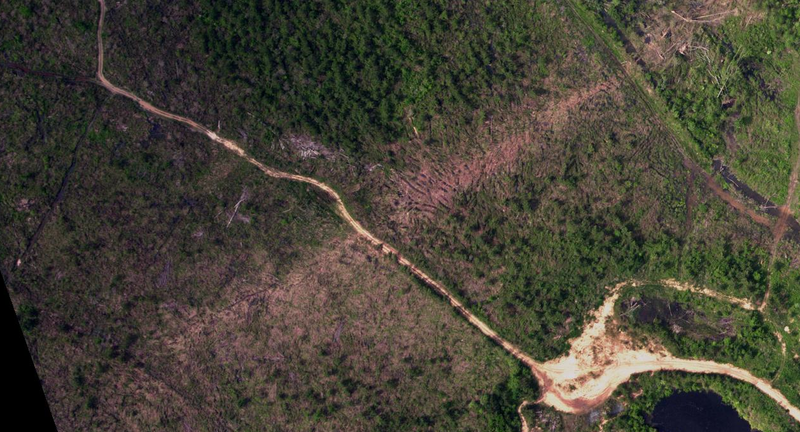 In the area above, the tornado debarked and flattened a narrow section of pine forest. Southern pines are extremely flexible and durable, but they were no match for winds over 250mph. *A special thank you to Smithville resident Darnell Collums for her assistance. □ Over a thousand google searches every month ask the question – “What was the strongest tornado ever recorded?” In all likelihood, a quarter of those searches came from me. Truthfully, there is no list that can honestly answer that question. Only a fraction of E/F5 damage paths are thoroughly surveyed, and only a fraction of all tornadoes capable of inflicting E/F5 damage are ever rated as such. 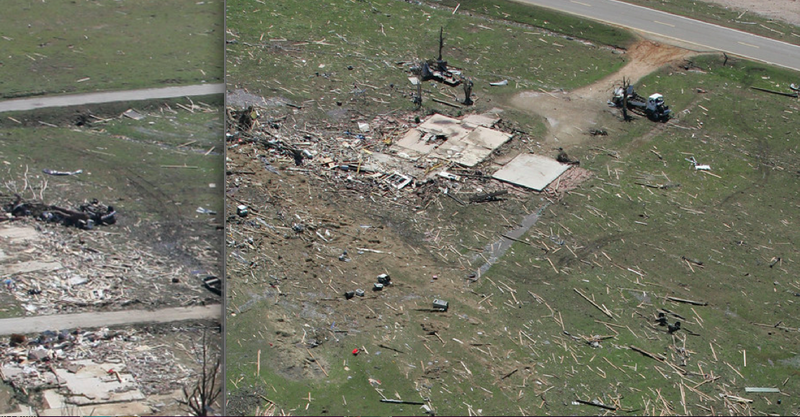 Three views of extreme tornado damage from the 2011 season (intensity increasing from left to right). 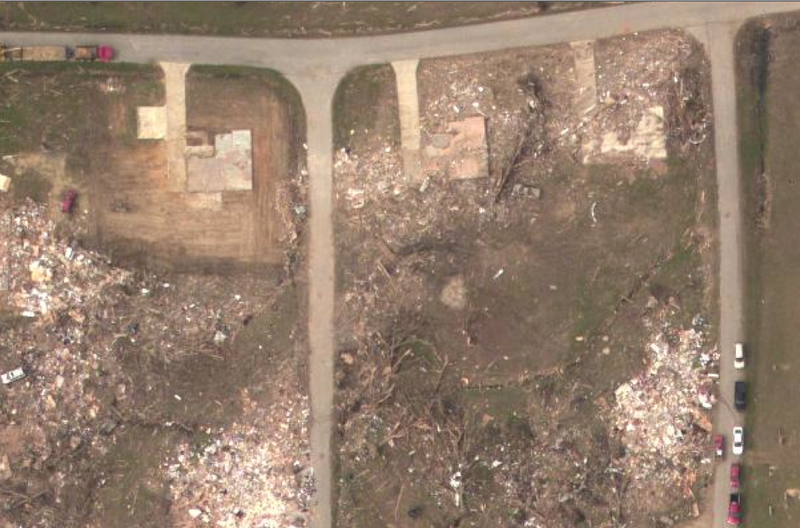 At left, the Phil Campbell tornado left a streak of damaged grass and empty foundations near Cornelius Drive. At center, pronounced grass scouring following the El Reno tornado near Oklahoma City. 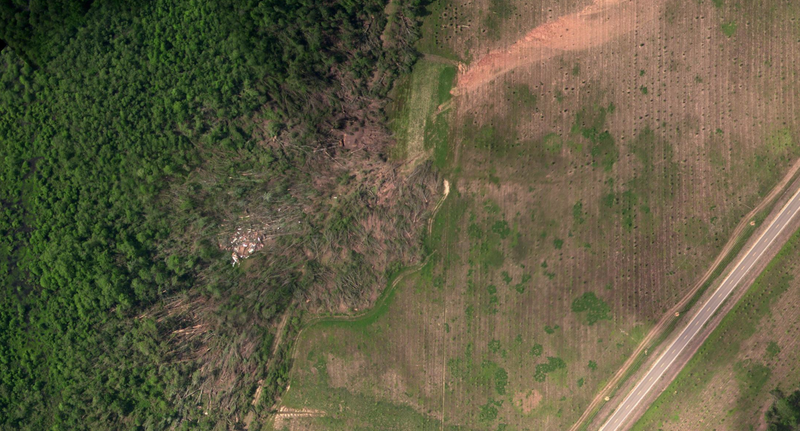 At right, extreme vegetation scouring and home damage from the Smithville tornado. Had all three tornadoes caused comparable damage, the El Reno tornado would have been ranked the lowest due to its modest forward speed. For the purposes of this list, damage severity is the primary categorization variable, along with some consideration for wind duration. Special emphasis will be placed on tornadoes powerful enough to scour vegetation and pavement from the ground. To eliminate the many tornadoes that never hit a man-made structure, only tornadoes that caused fatalities are examined. The list is skewed towards more recent events as there is far more information available today than there was twenty years ago. Tornadoes before 1970 are not considered. While far from definitive, this list is the result of literally hundreds of hours of research, e-mails across the country and conversations with other storm chasers. I believe it is as accurate a list as is available. It is flexible and always open to change. □ On June 1, 1990, one of the most violent tornadoes ever surveyed touched down far south of Tornado Alley in the deserts of southwest Texas. No photographs exist of the early evening storm, but witnesses described the tornado as a “low, turbulent, debris-filled cylinder extending to the cloud base” (Storm Data, June 1990). The tornado quickly widened as it travelled to the east-southeast, eventually reaching a peak width of 1.3 miles. Due to the area’s sparsely populated nature, few buildings were struck in the tornado’s early stages. The tornado narrowed slightly to approximately 0.7 miles in width as it approached several rural residences. One large, newly-built two-story home of excellent construction was completely obliterated, leading surveyors to award the damage an F4 rating (Woodall and Matthews, 1993). As the tornado continued eastward, it intensified further and left a pronounced streak of severe ground scouring. According to a survey report, the storm left “only a few rocks and an occasional greasewood or mesquite stump” (Storm Data, June 1990). Several roads were stripped of asphalt, including one that was left with a 300ft segment scoured down to the subgrade. Spiral marks indicative of suction vortices were also documented by surveyors (Woodall and Matthews, 1993). Mid-way through its lifecycle, the storm became rain-wrapped and weakened slightly. Two fatalities occurred in vehicles near Farm to Market Road 305. One man was killed in a car thrown 165 yards, and another man was found dead in a truck recovered 50 yards from an adjacent road (Woodall and Matthews, 1993). After causing the fatalities, the tornado re-strengthened and may have reached an intensity maxima. The storm then entered an oilfield and unanchored three 500-barrell oil tanks, each weighing approximately 180,000lbs, and tossed and rolled them three miles to the east. Two of the oil tanks were tossed 600ft up the side of a hill with a steep incline (Storm Data, June 1990). Nearby, a drainage culvert was scoured of concrete and large oil pumps were damaged or destroyed (Storm Data, June 1990). After this point, the tornado struck no substantial structures and dissipated just after nightfall. A stringent damage survey gave the tornado an F4 rating due to the residential damage. The severity of the ground scouring and tree damage, however, was among the most intense ever photographed. Additionally, the long-distance movement of massive oil tanks is perhaps the most impressive instance of tornado damage ever recorded. At left, image of a drainage culvert that was scoured of cement (Image by Wayne Greene). At right, the remains of a vehicle in which a fatality occurred. In the worst affected areas, dense balls of wire and debris several feet in diameter were recovered, a highly unusual damage feature. 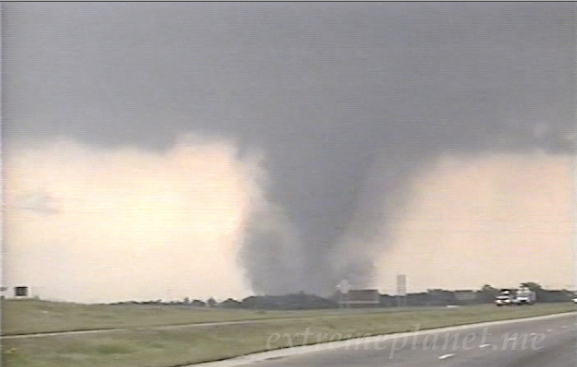 Image of the Bridge Creek tornado around the time the world record velocity was recorded. The Doppler On Wheels can be seen at left. There is no doubt, however, that the Bridge Creek tornado was exceptionally violent. While deemed a “minimal F5” by one piece of NWS literature, the tornado caused some of the most impressive vegetation scouring ever surveyed. Media focused primarily on the tremendous damage in the Oklahoma City metro area, but the most intense damage occurred many miles southwest of the city in rural Grady County. Well-anchored homes were swept cleanly away, pavement was stripped from roads, trees were fully debarked and vehicles were thrown up to a mile, including one that was shredded and wrapped around a utility pole. A dozen fatalities occurred in a sparsely populated area near the Norman Spur of the H. E. Bailey Turnpike, a significant fatality rate considering the wide visibility of the storm. A further 24 deaths occurred after the tornado weakened slightly and ripped through Moore and housing developments near Tinker Air Force Base. The tornado was extremely well-covered by local news stations, so nearly everyone in the tornado’s path had plenty of time to seek appropriate shelter. 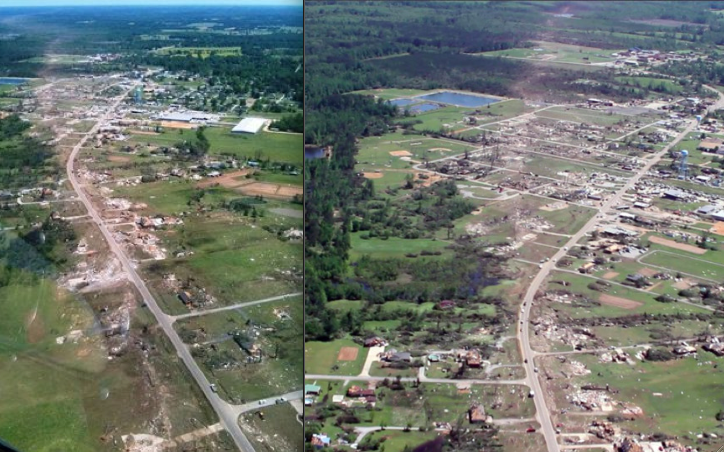 The death toll of 36 people made the Bridge Creek tornado the deadliest of the 90’s, yet still remarkably low considering the breadth of the destruction. 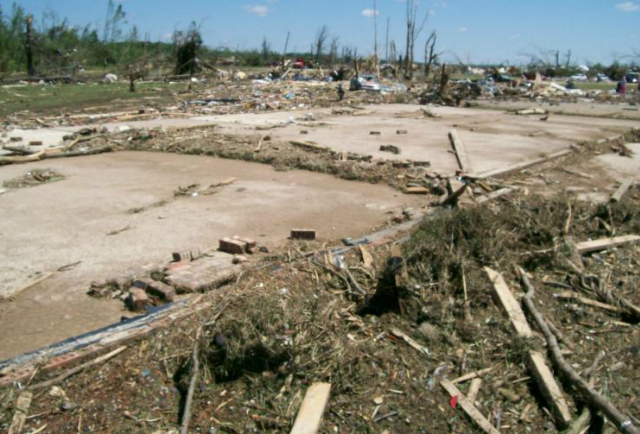 A detailed morbidity report revealed that more than a third of the tornado’s victims were in a “recommended place”, meaning in an interior room in a frame home with no exterior walls, often with a mattress or other large object for protection (Sheryll Brown, 2001). Looking at all seven “extreme” damage indicators (discussed at the end of post II), the damage path through Grady County is one of the most impressive in recent history. The tornado’s modest forward speed and large size, however, suggest that the duration of peak winds was significantly longer than some other E/F5 tornadoes. 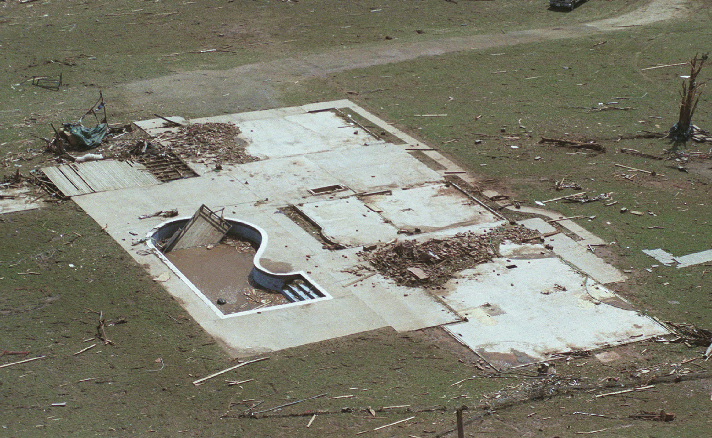 Aerial view of F5 damage to a home in Grady County (a secondary source says this image depicts a home in Cleveland County). 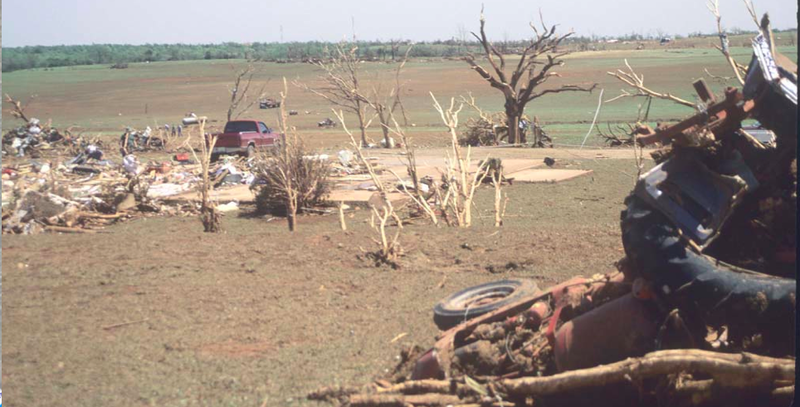 Extreme winds scoured vegetation from the ground, leaving behind a muddy aftermath unique to the most intense E/F5 tornadoes. Iconic image of a mangled truck wrapped around a utility pole in Grady County. Vegetation scouring near Bridge Creek was some of the most intense ever documented. □ During the 2011 Super Outbreak, an exceptionally violent tornado touched down in rural Mississippi. A group of storm chasers captured the rapidly rotating tornado as it ripped apart trees and sped to the northeast at 60mph. 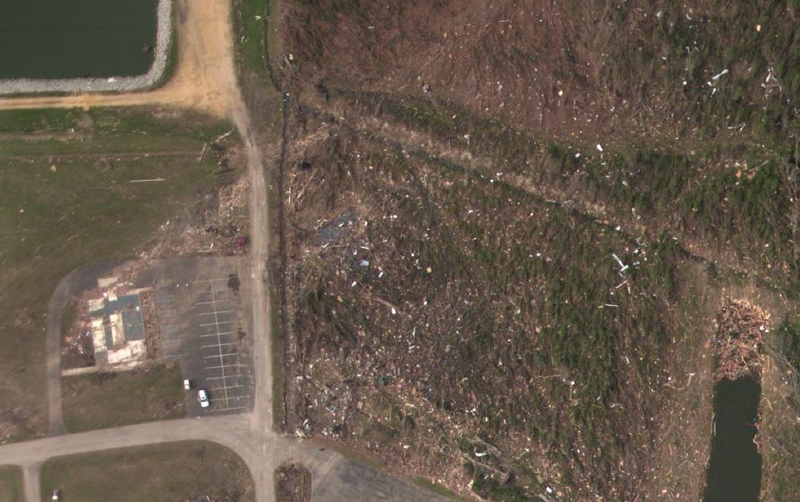 Only a few buildings were struck by the tornado, so its true damage potential will never be known. Three woman were killed in Kemper County when a mobile home was lifted into the air and thrown more than 300 yards. 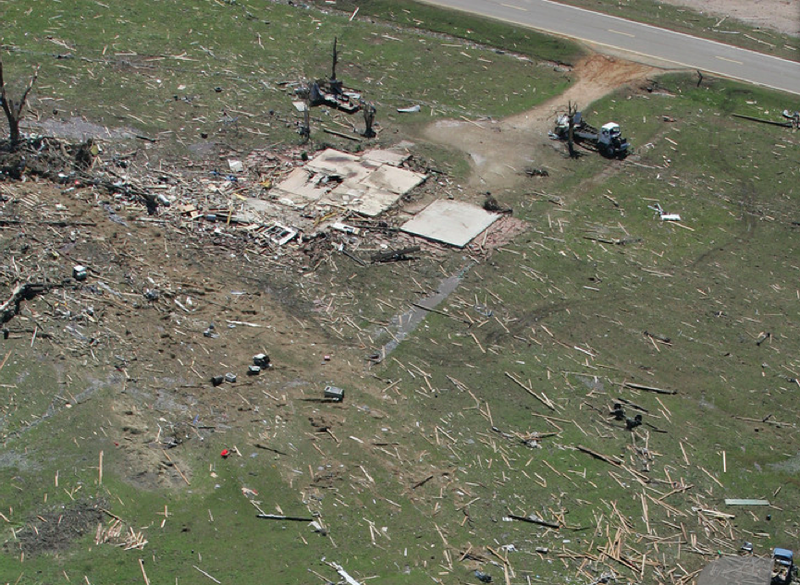 An NWS survey team found no evidence that the mobile home had made contact with the ground, so it likely remained airborne the entire distance before disintegrating on impact (NWS, 2011). Nearby, a “well-built” home was swept away, and several vehicles were thrown long distances and wrapped around trees. 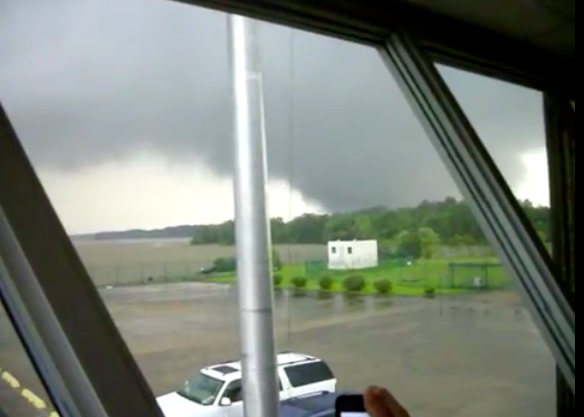 Footage of the tornado suggests that it remained fairly narrow as it approached the Neshoba County border. The storm further intensified and left deep scouring marks over a one mile area along Stokes Road. Surveyors noted that the narrow trenches, which were over 2ft deep in places, were approximately 10 to 20 yards wide and 50 to 100 yards long. Considering the forward speed of the tornado, it is likely the ditches were dug in less than two seconds by extremely powerful suction vortices imbedded within the main funnel. Massive trees weighing well over five tons were ripped out of the ground and lofted over a quarter mile from the edge of a wooded area, and several roads were stripped of pavement. 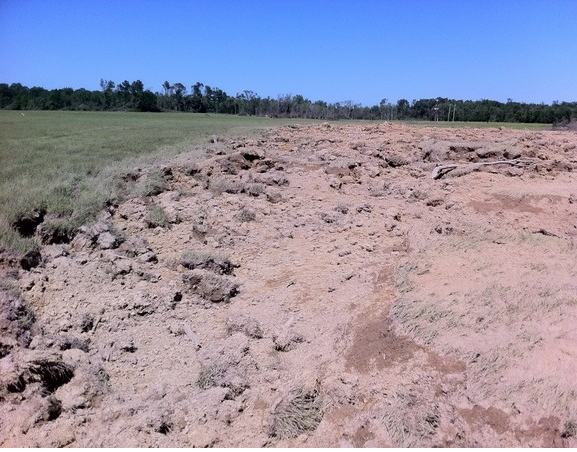 Violent tornadoes have been known to scour up to a foot of top soil from the surface, but the deep, penetrating ditches in Neshoba County appear to be unique. If there was ever evidence of winds over 300mph making direct contact with the ground, this is as good an example as there is. The lack of other damage indicators, however, leave open the unlikely possibility that the soil in the area was particularly vulnerable to the effects of violent tornadic winds. 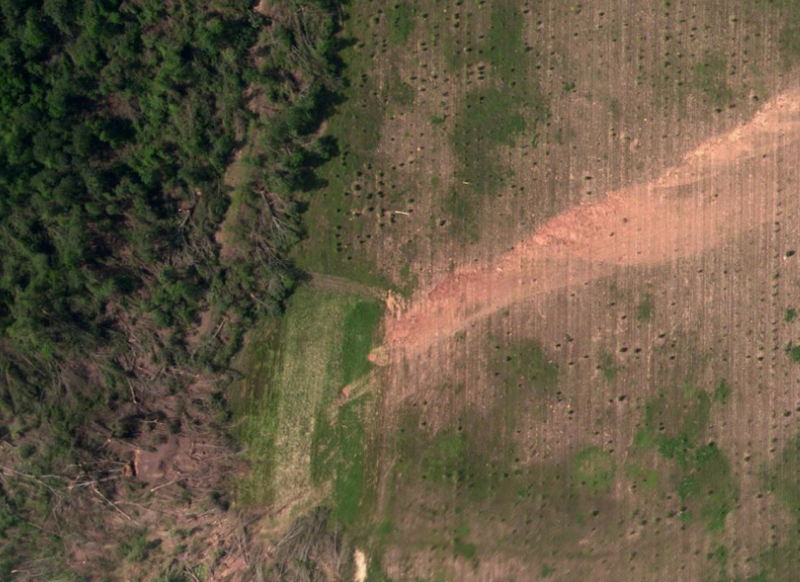 Extreme ground scouring in Neshoba County, Mississippi. 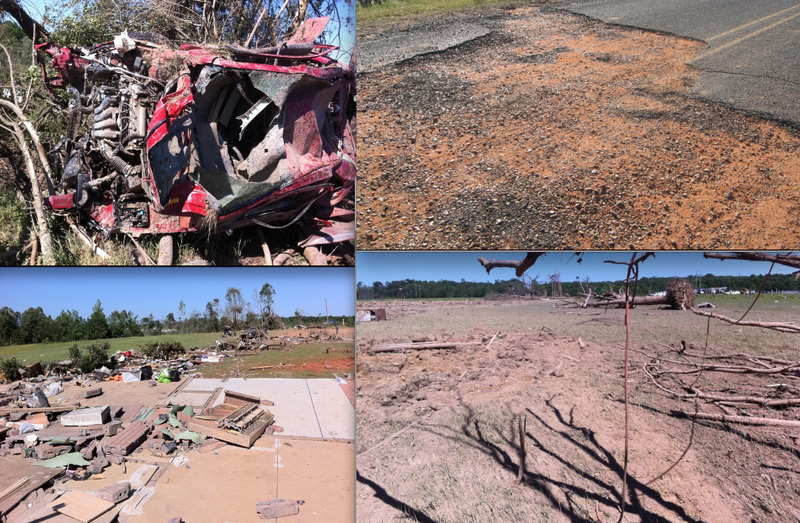 Most intense tornadoes scour the ground through the removal of topsoil, but the Neshoba County tornado penetrated the ground like a drill and tore out large clumps of dirt and rock. The soils in eastern Mississippi are primarily alluvial deposits with a high clay content, much like the soils found in the Great Plains. 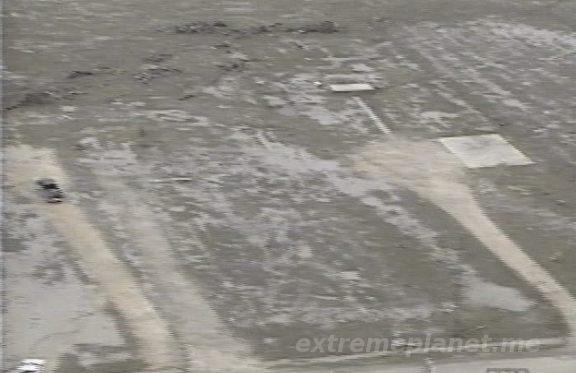 Additional video frames of severe ground scouring. Footage of the tornado around the time the damage occurred shows impressive, but not unprecedented rotational velocity. The vortex/vortices responsible for the trenches were likely hidden within the larger funnel. At left is severe damage to a car and a “well-built home” that was swept away. The building and vehicle damage occurred well before the tornado reached peak intensity. At top right, one of several roads that was stripped of pavement. At bottom right, one of the many large trees that originated from an unknown location. □ During the 2011 Super Outbreak, one of the most violent tornadoes ever surveyed cut a path of devastation through rural Mississippi. The fast moving tornado touched down three miles southwest of the tiny town of Smithville and rapidly sped to the northeast at 70mph. Within seconds of touchdown, the storm was powerful enough to debark large pine trees. An extremely violent sub-vortex less than 50 yards wide developed at the edge of a wooded area two miles from the center of town. The inner core of the storm scoured a long trench through a field as it travelled parallel to Highway 25 towards Smithville. Seven deaths occurred in rapid succession as large homes on the north side of the highway were swept completely away while homes on the other side of the street suffered only moderate damage. Less than three minutes after first reaching the ground, the massive, gray funnel enveloped more than half of Smithville, leading to another nine deaths east of Court Street. Large, well-constructed brick homes were swept cleanly from their foundations as the storm ripped through town in less than 20 seconds. The EF5 damage and all the fatalities were focused within a narrow streak of incredibly intense damage that sliced through the northern side of town like a razor. Surveyors documented extensive vegetation scouring, completely debarked trees and vehicles that were lofted more than 3/4 of a mile. 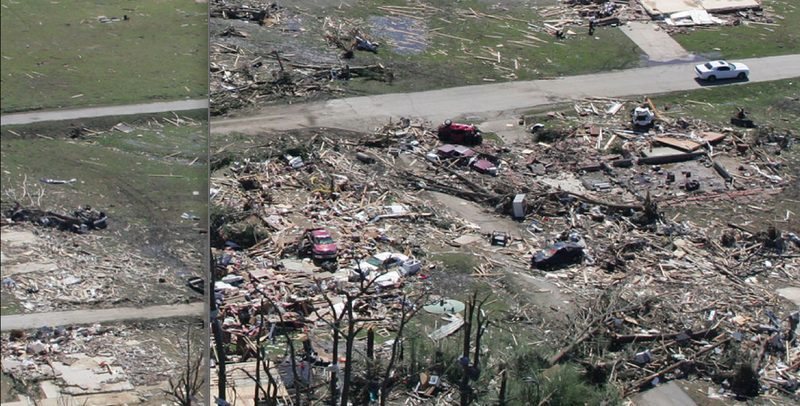 Some cars were pulverized into indiscernible pieces, and one truck remained missing at the time of the damage survey (NWS, 2011). Approximately 50 frame homes and two dozen businesses were completely obliterated in the town of Smithville, and 16 people were killed. The death toll would likely have been much higher had the tornado not struck during work hours when many people were away from their homes. The tornado weakened not long after tearing through town but continued for an additional 34 miles. In total, 24 people lost their lives (the official NWS report lists 23 deaths). The Smithville tornado was one of the most powerful tornadic events ever recorded and probably brought some of the strongest ground level winds of any tornado in recent history. A post detailing the tornado’s damage more thoroughly can be found here. At left, a narrow strip of deep ground scouring west of Smithville, where the tornado entered a period of explosive intensification (Image by Mel Webster). At right, the tornado left some of the most extreme tree damage ever photographed. 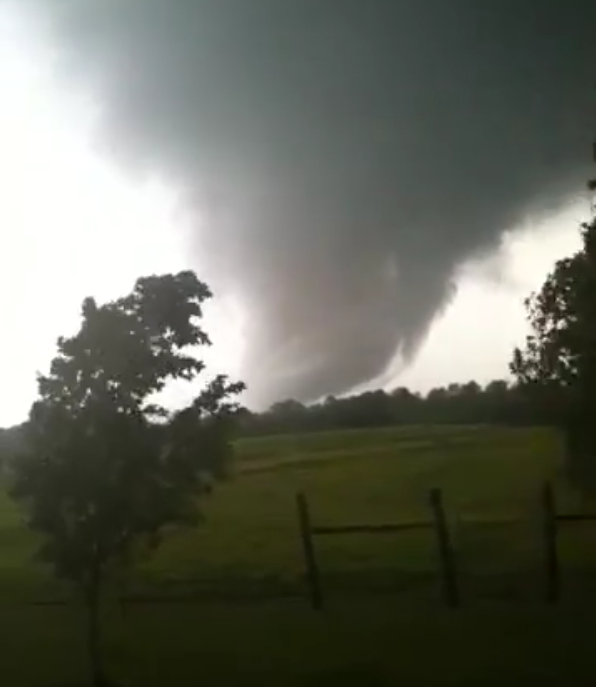 View of the Jarrell tornado as it obliterates homes on Double Creek Drive. The slow moving storm caused the most intense wind damage ever documented. □ On May 27, 1997, a tornado of unparalleled violence touched down in the hills of Central Texas. The storm was spawned from a rapidly developing supercell that drifted slowly to the southwest, the opposite direction of most severe thunderstorms. Initially, the thread-like funnel caused little damage as it followed the I-35 towards the small town of Jarrell. Unexpectedly, the tornado entered a period of explosive intensification several miles north of Jarrell. In less than two minutes, the narrow funnel expanded into a massive, violently rotating wedge tornado. Large sections of pavement were torn from county roads as the storm made a shift to the west-southwest, sparing the center of Jarrell. Homes that lined County Road 305 and Double Creek Drive, however, lay directly in the storm’s path. Good visibility and excellent warning meant that all the area’s residents were well aware of the tornado, but interior rooms in well-constructed homes provided no protection. 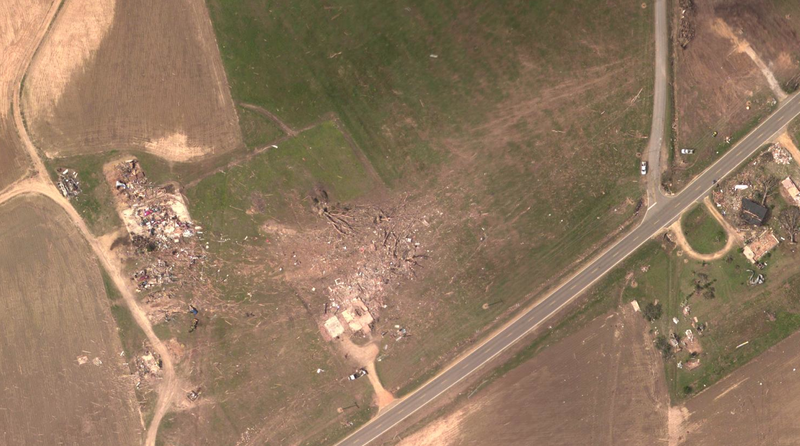 Every home in the tornado’s path was swept cleanly away, killing entire families. In the homes where the fatalities occurred, there were only three survivors – all on the far northern edge of the tornado’s damage path. The 0% survival rate for those above ground in the core of worst damage is unique to the Jarrell event. The damage in the Double Creek area was the most intense ever surveyed. The thick pasture grass that once covered the area was ripped completely from the ground, along with more than one foot of soil. The sheds, fences and trees that populated the neighborhood were also removed, leaving nothing but fields of empty mud. All of the pavement in the worst affected areas was scoured, and every telephone pole in the core damage path was sheared inches above ground level. Surveyors also documented perhaps the most extreme instance of debris granulation ever recorded. All of the destroyed structures, trees and utility poles were pulverized into tiny pieces, quite literally leaving nothing left for emergency crews to sift through. The bodies of the victims were thrown long distances, many more than a quarter mile, and were nearly impossible to identify. Additionally, more than a dozen vehicles known to have been in the Double Creek area were removed without a trace (Grazulis, 2003). Debate exists over the nature of the Jarrell damage. 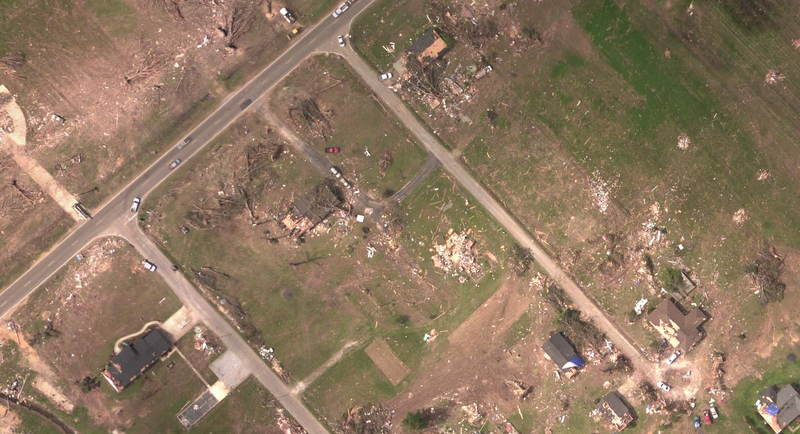 Post-storm surveys were challenging due to the complete lack of debris, but some of the homes were determined to have been well-constructed (NOAA, 2003). Additionally, one of the destroyed homes where three fatalities occurred had thick stone walls 24-inches thick (NBC, 1997). Even so, many believe that the slow movement of the Jarrell tornado, which averaged 8mph, was primarily responsible for the severity of the damage. While the tornado’s slow pace surely contributed to its astounding violence, the nature of the damage was highly indicative of F5 winds. Whether it had the highest winds or not, the damage from the Jarrell tornado was unparalleled and worthy of the #1 spot on any list of tornado damage severity. 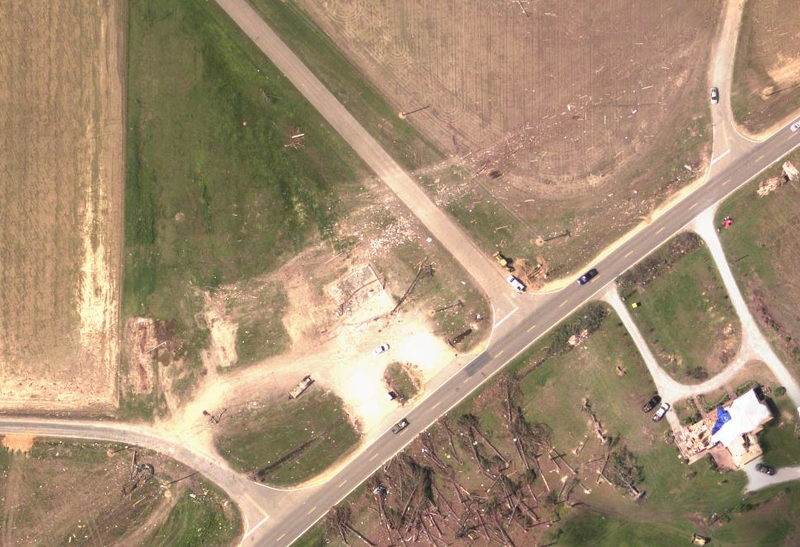 A more thorough examination of the Jarrell tornado, along with damage pictures, can be found here. Catastrophic damage to frame homes following the Jarrell tornado. Thick pasture grass, trees, property fences, pavement and backyard gardens once covered the muddy landscape. Most of the debris, including more than a dozen vehicles, was splintered into indiscernibly small pieces and never recovered. Extreme damage to properties on County Road 305. A woman and her teenage son were killed in a large home that once rested on the bare foundation at right. Chandler, MN – June 16, 1992 – Caused extreme vegetation damage, but only one death. 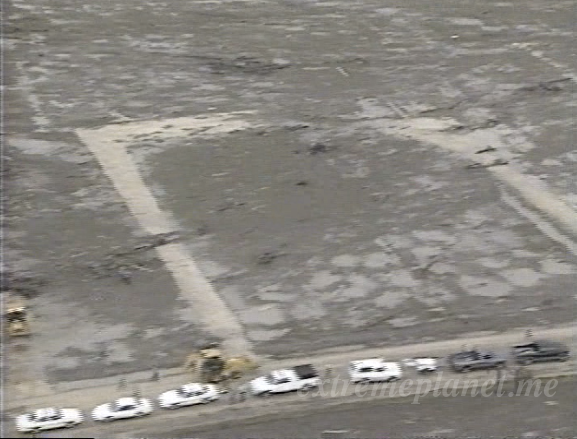 Hesston, KS – March 13, 1990 – Scoured vegetation and swept homes completely away. 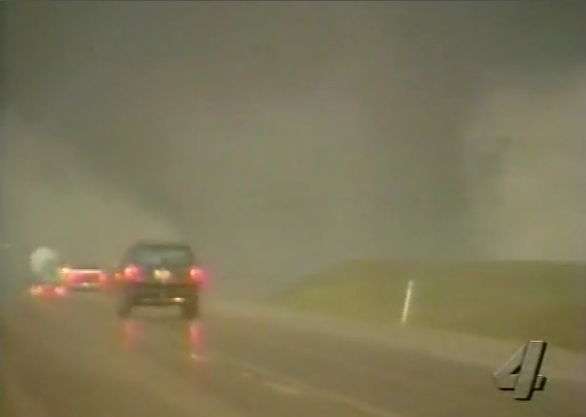 Goessel, KS – March 13, 1990 – Media reports say Fujita estimated 300mph+ winds. 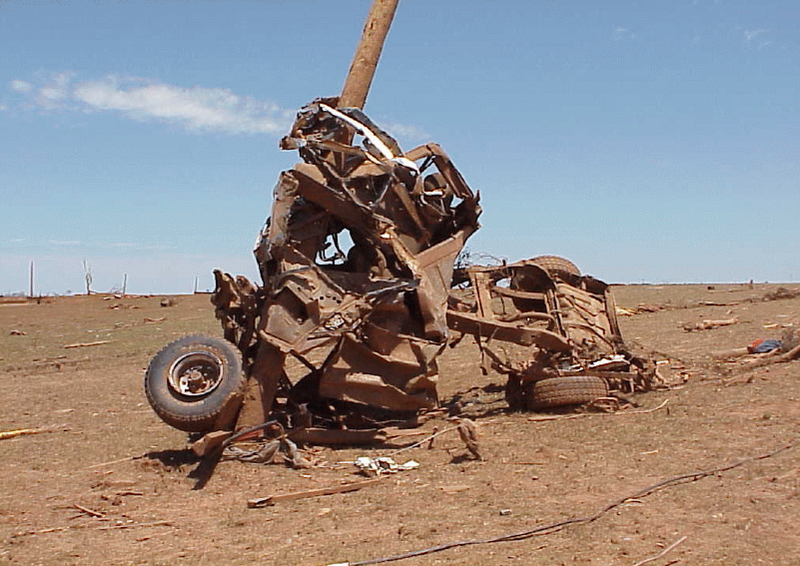 Girard, Kansas – May 4, 2003 – Severe ground scouring, chasers believed it was an F5.